Stories aren’t just told in words. If we sat and looked at the stories of our lives, what would we note. The big events? Definitely. But it’s the in-betweens that make up the majority of our life. The little moments. It’s the particular beauty that is your love for your partner two years in, or ten years in. Or perhaps the perfect pandemonium of life with a young family, and the gradual changes in your children that you don’t actually notice until you look back and wonder where the time went. I find an infinite amount of beauty in the in-betweens. The thousands of moments that make up a big life. The everyday. I’m a family photographer based in the inner north of Melbourne but shooting anywhere and everywhere. 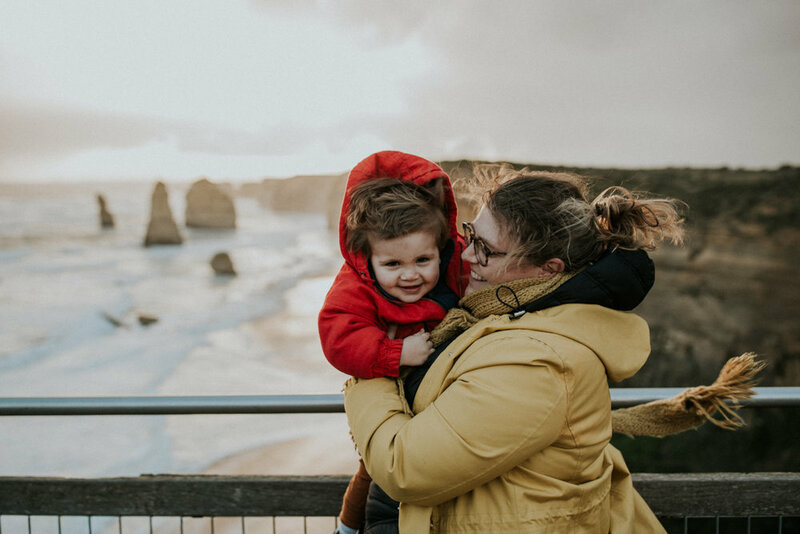 I’m mama to Max, my firecracker; the little man that propelled me into a truly creative life by forcing me outwards when I wanted to turn inwards during the chaos of early motherhood. I studied and worked as a journalist after school, before doing a Masters of Creative Writing and leaving Sydney for Melbourne in my mid-20s. I’ve always had a love of words and poetry. When I was given an SLR camera for my 21st birthday by my parents, it set me off on a path of creativity I hadn’t explored before. I became completely obsessed with taking photos and would go for long walks with my camera. For me, photography has always been just another way to explore my curiosity about the world and tell stories. When Max came along in late 2016, I challenged myself to pick up my professional camera weekly (not just my phone!) and take a photo of him every week for a year. I still do this – you can see these weekly photos on my Instagram under the hashtag #the52project. I started on January 1, 2017 when Max was two weeks old and for me, that year marked a seismic shift in ‘becoming’ a mother. At the end of that year I saw a new beauty in the ‘every day’, and let me tell you, there’s a lot of ‘every day’ in new motherhood! Photography is my fulltime gig (including my commercial work at Sister Scout Studio) and I’m always chasing the beauty in unseen things; gestures and freckles and magic light. I love to work with families and couples like you who understand that candid and natural photography – the way you TRULY exist in the world - is what you’ll get when you book with me. And I can’t wait to meet you.